So there's this guy in Berlin. He has a Bullitt cargo bike from Larry vs Harry. He equipped it with speakers, a karaoke system with microphone and a laptop. He started showing up in Mauerpark in Berlin and got some people to sing. It's now become a cult classic in the city. On nice days you'll get 1000 people sitting there in the amphitheatre, staring down at the Bullitt and listening to crap karaoke. Copenhagenize.com is not responisble for the song quality of the above video. Here's a little video about the next generation of Bullitt karaoke bikes. Perfect for bike geeks and music freaks, showing how a sound system was made for the Bullitt. The karaoke will still be crap, I'm sure, but the sound quality will be much better. 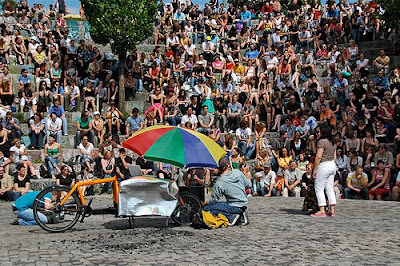 The new Bullitt karaoke bike will premiere this Saturday in Mauerpark in Berlin. 14 June 2009. If only the guy in Copenhagen who delivers cocktails on his Bullitt could make the trip to the German capital.